Please join us in the High School Auditorium for an evening program on Tuesday, Oct. 18 at 6:45 P.M. as part of our fight against drug abuse. KCSD will host an All In Against Drugs Night for all district parents (grades K to 12). Featured will be a video created by the FBI called “Chasing the Dragon,” which graphically illustrates the horrors of opiate drug use. Though we have no knowledge that this is an issue in our community, stories about opiate drugs have been in the news, and we want to give you an opportunity to learn more about the problem. Also on the program will be presentations by FBI agent and Unionville parent Kevin McShane and Kennett High School counselor Fran Ryan. They will offer valuable advice about keeping our children drug-free and safe. You will receive an “All In” t-shirt and a t-shirt to take home for each of your children. Though we must limit attendance at this program to adults only, you will learn how you can view this video at home with your children. All of us at KCSD urge you to attend. We want to be your partners … to help you stay well-informed … to help you be better prepared … so that you can help your children make positive choices and avoid starting on a pathway to drug abuse. I look forward to seeing you on Oct. 18. See a video created by the FBI called “Chasing the Dragon,” which graphically illustrates the horrors of opiate drug use. 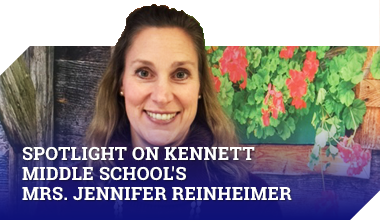 Learn more about keeping children drug-free and safe from FBI agent and Unionville parent Kevin McShane and Kennett High School counselor Fran Ryan. Receive a free “All In” t-shirt and a t-shirt to take home for each of your children. Learn how you can view this video at home with your children. KCSD and parents … partners in preventing drug abuse among our children and young people. Kennett High School Celebrates Homecoming with Spirit! Students will be showing their school spirit throughout the week in the form of themed spirit days. On the heels of this weekend’s Eagles victory over the Steelers, students can show their pride for his/her favorite team by wearing sports themed attire on Monday. Tuesday, students can go back in time and show off their style through their favorite decade themed attire. Wednesday gets cultural when students can celebrate their heritage, culture, and/ or nationality. Thursday, we wage war against Cancer! Each grade can wear the color that represents which type of cancer they are fighting against! Freshman glitter in gold to fight against Pediatric Cancer. Sophomores get passionate in purple to fight against Hodgkin’s Lymphoma. Juniors electrify the color blue with their fight against Prostate Cancer, while our Seniors create a blackout as they fight against Melanoma. Friday, we come together as a school community to show our Kennett Pride! Students go Blue and White as we get ready for the Pep Rally, Homecoming Parade, Dance and Sporting Events! For the second summer, the Kennett High School Humanitarian Club volunteered at the Mary D. Lang Kindergarten Center to assist students. The club also sponsored a program at the high school. The Humanitarian Club delivered snacks to students participating in summer school in grades one through five at Mary D. Lang Kindergarten Center, Monday through Thursday, July 11 through August 11. Members of the club volunteered time in the morning hours to organize and deliver food to students in their classrooms. They provided snacks to 266 children every day, with an additional snack to take home for the weekend. Humanitarian Club members Molly Adelman, Olivia Pagliaro, and Ben Skross chaired this summer’s program at the Kindergarten Center. They were assisted by six student volunteers from KHS and another two from Unionville High School’s National Honor Society Chapter. “For years to come, I’m certain I’ll be thinking about the impact of being able to see the smiling faces of the kindergarteners every day,” said Chairman Molly Adelman. Ms. Lisa Teixeira, KHS librarian and Humanitarian Club adviser, supervised the program at the high school. Kennett High School’s library media center was available to forty summer school students who could come to the library to read, check out a book, use the computers, and eat a snack. The Kennett High School football team also volunteered their time to unload and unpack food deliveries, and students in Mr. Rob Wagner’s summer school class packed snack bags every Thursday, truly making the summer program a group effort. 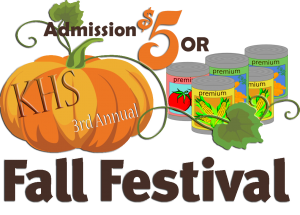 On Thursday, September 29, 2016, come out and join the Kennett High School Humanitarian Club as they host its Third Annual Fall Fest in front of the school immediately following the homecoming parade. The fest will run from approximately 6:30 to 8:30pm. Kicking off this year’s food drive in style, Fall Fest promises to be a fun night with music featuring the Kennett High School faculty band and an a cappella student group, snacks, games, and a bonfire with s’mores. Admission to the event is either $5 or five cans of food, with all donations benefitting the Kennett Food Cupboard. Hope to see you there! Homecoming 2016 is fast approaching! To kick off the week, students and staff members are invited to participate in Spirit Week theme days. Read the schedule below and dress accordingly! Students will have an opportunity to show pride for his/her favorite sports team. Students will have the option to go back in time and dress in the style of their favorite decade. Students can celebrate all cultures, countries, and nationalities. 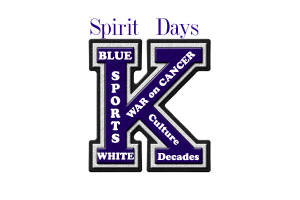 Students will show off their KHS pride by wearing blue and white. This year members of the 2016 graduating class from Kennett High School participated in Kennett Consolidated School District’s first-ever Senior Stroll. An instant success in the eyes of students and staff members alike, the Senior Stroll invited the 2016 graduating class to don their graduation garb and walk the halls of all kindergarten, elementary, and middle-school campuses in the District. Together, the graduating class traveled to Kennett Middle School, New Garden Elementary School, Bancroft Elementary School, Greenwood Elementary School, and Mary D. Lang Kindergarten Center. Younger students lined the halls in their respective schools to cheer on the graduating seniors. There were high fives, hugs, and even tears as students and staff members reconnected and reminisced about their wonderful memories of growing up in the Kennett Consolidated School District. The Senior Stroll is bound to become a tradition after this initial success. Created to be a lifetime memory for graduating seniors, the Senior Stroll quickly became much more. 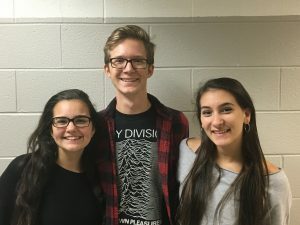 The 2016 graduating class has become an inspiration to all students in the District, motivating them to work hard and graduate so they too can walk the halls, reminiscing about the first-ever Kennett Consolidated School District Senior Stroll.